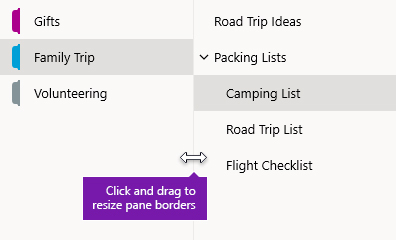 In response to feedback we’ve received from our customers, we’ve made several updates to the navigation interface in the newest versions of OneNote. This article contains tips to help you get going quickly. 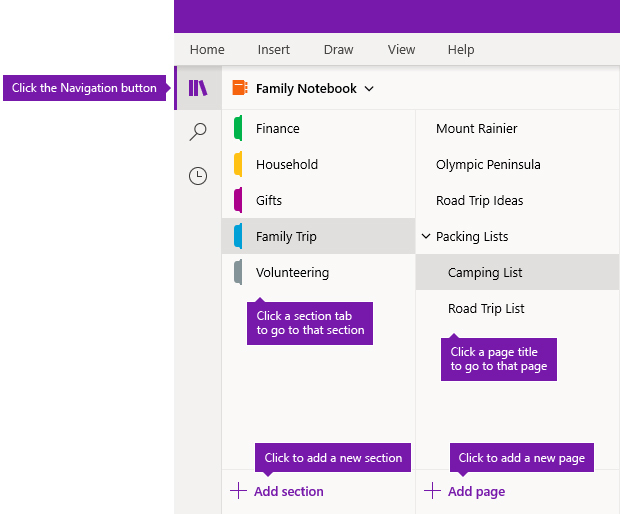 Note: The new navigation features outlined below are currently rolling out to OneNote for Windows 10 and OneNote for Mac, and will be coming soon to OneNote Online and OneNote for iPad. If you don’t have automatic OneNote or Office app updates enabled, be sure to check manually for any available updates. If you always want the earliest access to the newest OneNote features, consider becoming an Office Insider. The OneNote app window in the Windows and Mac versions now offers more note-taking space by providing an easier way to control the navigation interface. You can choose to display the notebook, section, and page navigation panes whenever you need them, and then hide them again when you’re done — leaving you to focus on your work, your thoughts, and your ideas. The Navigation button toggles the navigation panes on or off. Click it to display your current notebook’s hierarchy, to switch between pages, sections, and notebooks, or to create and organize sections, pages, and notebooks. Click the button again to hide the navigation panes and return to your current page. The Search button provides an entry point to search for keywords and phrases in specific places in your notes — or across all of your notebooks. Besides text, you can also search for any tags that you’ve applied to selected notes. Click any search result in the list to jump to its location in your notes. The Recent Notes button displays a chronological list of pages that you’ve recently viewed or edited, as well as the sections and notebooks they’re found in. This is helpful when you need to quickly switch back and forth between pages in different sections or different notebooks, or when you want to quickly continue taking notes on a different computer or device. Tip: The Recent Notes button is currently only available in OneNote for Windows 10. However, if you’re using OneNote for Mac, you can easily browse and open recent notes by clicking File > Open Recent on the menu bar. If you’ve previously used OneNote on your computer or device, it will open the last notebook and page that you last worked in. To view the hierarchy of your current notebook, click the Navigation button near the upper left of the OneNote app window. The pages and sections in your current notebook are displayed in two navigation panes — sections on the left, and pages on the right. To switch to any other section or page, click its title. Tip: You can right-click (Windows) or Control-click (Mac) any page or section title and then choose from more options on the menu that appears. To switch to a different notebook that you’ve previously opened, click the Notebooks dropdown arrow that appears above the section and page lists. In the Notebooks list that appears, click the name of the notebook you want to open. 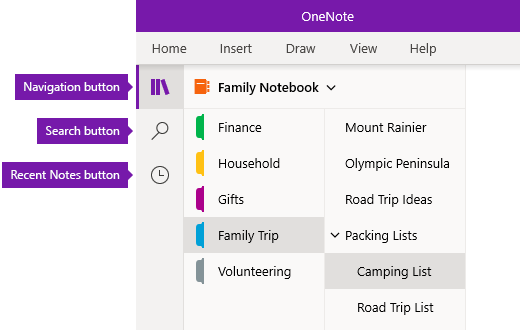 If no other notebooks are shown in the list, or you’re not seeing the notebook you want, click More Notebooks to open any additional notebooks that are available in the cloud account with which you’re currently signed into OneNote. Tip: If the notebook you want is on a different account, see Switch between your home, work, or school accounts later in this article. In OneNote, your notebooks never run out of space. You can easily add more pages or sections to any notebook — and you can add new notebooks to separate your work by your subjects and projects, or by the locations in which you take notes (for example, at home, at school, or at work). To create a new section in the current notebook, click the Add section button at the bottom of the section list. To create a new page in the current section, click the Add page button at the bottom of the page list. To create a new notebook, click the Notebooks dropdown arrow that appears above the section and page lists. In the Notebooks list that appears, click the Add notebook button. Note: OneNote for Mac users can also use the File > New commands on the menu bar to create new sections, pages, and notebooks. In addition, both OneNote for Mac and OneNote for Windows 10 let you create new items by using keyboard shortcuts. For more information, see the related links at the end of this article. You can easily resize the navigation panes to make them wider or more narrow. This is useful if your section and page titles frequently appear truncated, or if you want to maximize your note-taking space while the navigation bars are shown. Move the mouse pointer over the vertical edge to the right of the navigation pane that you want to resize. When a double-headed arrow pointer appears, click and drag the edge of the pane to the left or right to make it as wide as you want, and then release the mouse button. OneNote’s best-kept secret is its ability to instantly search the entire contents of any notebook — or even all of your notebooks. In the search box at the top, type a keyword or a phrase to search for. If you’ve searched for something similar before, you may see suggestions of Recent Searches that you can click again. Tip: In any version of OneNote, you can use quotation marks around a phrase that you type into the search box. Doing so finds all occurrences of that exact phrase instead of the individual words. By default, OneNote will search for the text you entered in All Notebooks that you currently have open. However, you can set the search scope to only search in only the Current Notebook, in only the Current Section, or on only the Current Page. In OneNote for Windows 10, click the list dropdown arrow under the search box to select your search scope. In OneNote for Mac, click the funnel icon, and then select the search scope from the menu that appears. Underneath the search box and search scope selection, click Pages to see search results found in the text of your notes, or click Tags to search only within the descriptive text of note tags you’ve applied to selected notes (for example, “Important” or “Question”). If your search text was found, it will appear in the search results list. Click any result that you want to view and OneNote will jump that page. When you’re finished reviewing search results, click the Search button again to close the navigation and return to your current page. Tip: Not finding what you’re looking for? Make sure you’ve signed into the correct account and then open the notebooks that you want to search on that account. For more information, see Switch between your home, work, or school accounts in the section immediately below. For a notebook to appear in your Notebooks list, or for its pages to show up in notebook search results, you must be signed into the account that contains that notebook, and you need to have opened that notebook at least once. If the notebook you want is not stored on the cloud account that you’re currently signed in with, you’ll need to either add or switch to a different account. OneNote for Windows 10 users can stay signed in with multiple personal, work, or school accounts and navigate between their notebooks with ease. To view or change the accounts you use with OneNote for Windows 10, click the Settings and More button in the upper right corner of the app window, click Settings, and then click Accounts. Verify that the account you want appears in the list of accounts that opens, and click Add account if you want to add a new account. To remove an account that you no longer want to use with OneNote, click to select that account in the list, and then click Sign Out. To prevent opening such notebooks again, we recommend removing them from your Notebooks list. To do this, right-click the name of a notebook you want to close, and then click Close Notebook. Tip: To switch accounts in OneNote for Mac, click OneNote > Sign Out on the menu bar to sign out of your current account, and then click OneNote > Sign In to sign into the account you want. Whether you use OneNote on a PC or on a Mac, you can easily customize your OneNote experience by choosing from available app preferences. In OneNote for Windows 10, click the Settings and More button in the upper right corner of the app window, click Settings, and then click Options. In OneNote for Mac, click OneNote on the menu bar, and then click Preferences. Got feedback about OneNote? Share it with us! Many of the feature updates outlined in this article were the direct result of feedback we’ve received from OneNote users like you! After you’ve had a chance to try out these features, please take a moment to tell us what you like about your OneNote experience, and what suggestions you have for making it even better. Your product feedback is sent directly to the OneNote team and it can help shape the future of our favorite note-taking app. In OneNote for Windows 10, click the Settings and More button in the upper right corner of the app window, click Settings, and then click Feedback. In the Windows 10 Feedback Hub app that opens, follow the on-screen prompts to enter and submit your feedback. In OneNote for Mac, click the smiley face icon in the upper right corner of the app window, and then follow the on-screen prompts to enter and submit your feedback. Additionally, if you have any feedback about this particular Help article, please let us know by clicking your response to the question “Was this information helpful?” that appears as you scroll to the end of the text. Thank you for your feedback and thanks for using OneNote! What’s the difference between OneNote for Windows 10 and OneNote 2016?